Friends and benefactors of NGU often provide perks, discounts and special rates for members of the NGU family. This page will direct you to all current offers. The following are programs provided by the North Greenville University Alumni Association are designed for the interest and needs of our alumni. The Alumni Association offers its members many opportunities of supporting and volunteering to become more actively involved in the future of its alma mater. If the Alumni Association can better serve you please do not hesitate to send our director an email at julie.styles@ngu.edu. Do you know an alumni who deserves one of these awards? Call us today and let us know! Distinguished Alumni Award - The nominee has distinguished accomplishments that have brought or will likely bring recognition to North Greenville. Outstanding Young Alumni Award - The nominee has loyally served North Greenville and brought recognition to the college. Friend of the Year Award - The Friend of the Year Award is presented annually. The recipient is recognized for outstanding service to North Greenville University by one who did not attend NGU. Maintaining the alumni database is an ongoing effort of the Alumni Affairs office. Identifying information from alumni is needed to keep the communication lines open with the alumni. To update your address, telephone, email address, employment profile, etc. email alumni@ngu.edu. The Alumni Association offers a hard-bound directory every ten years and within the next year a on-line registry will be made available which will sort by class year and geographical area. More information will be made available in the near future about the on-line registry. Former athletes and coaches, whose connections with the college as a student athlete or coach have been dissolved for greater than a one-year period, will be eligible for induction into the Athletic Hall of Fame. In order to be under consideration for nomination, it is understood that athletes and coaches must have participated or coached for North Greenville University in good standing for at least two seasons. The athletes being chosen are to have demonstrated high athletic achievement while at NGU and/or demonstrated high athletic achievement while pursuing their athletic careers after leaving North Greenville University. Coaches being chosen are to have demonstrated high professional achievement while at NGU and demonstrated a "selfless" attitude in influencing the NGU athletes in a positive manner. Coaches may be considered who demonstrate a high degree of coaching achievement while pursuing their coaching careers even after leaving North Greenville University. Recommendations for honorary inductees should reflect the following: The individual should have made significant contributions to the University's athletic program, which have resulted in its success, growth, and development. This could include above-average financial support, peripheral commitment, and/or other longstanding support of the NGU athletic program. All individuals being considered for members in the NGU Athletic Hall of Fame must have demonstrated the highest standards of personal character and morals during the time at NGU. The requirement of highest standards of personal character and morals must still be present at the time of the selection and induction process. Biltmore provides discounted tickets for Alumni. Career Services is committed to preparing North Greenville University students and alumni to make informed decisions about their futures through our career planning and development programs and employment services. In support of the university's mission, Career Services is a vital contributor to our students' total educational experience focusing on practical application and learning experiences. Our purpose is to facilitate positive partnerships and engagement opportunities among students, alumni, and employers in our community and beyond. Meeting their post graduate career goals. Are you a recent graduate now pursuing advanced studies or beginning your career? The NGUCS website is a useful resource for you, and our staff are a phone call or an email away to answer your questions. Are you an alum who is well established in your field? If so, we invite you to become familiar with our services and to volunteer your expertise by advising students engaged in career exploration. We hope you'll consider carrying on a tradition of excellence by hiring other North Greenville Alumni. 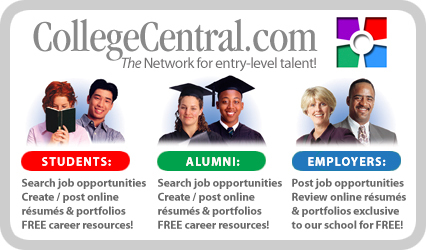 CCN is an online career center that NGU's Office of Career Services works with in order to assist students in developing resumes, creating portfolios, and improving interview skills. This service is FREE to students, alumni, and employers who may be looking to hire NGU graduates. You can also find a national and local Jobs Board posted at the site. All students are encouraged to sign on and get started! Liberty Mutual gives NGU alumni a discounted price. The South Carolina General Assembly has authorized the South Carolina Department of Highways and Public Transportation to issue special license plates for each of the colleges and universities in the state. Your North Greenville University plate, in school colors, carries the bi-centennial college logo along with the words, "North Greenville University." Designated DMV branch offices will handle all first time issuances of the North Greenville University plate. The Department suggests that you contact your local DMV branch office to verify the availability of the North Greenville University plate. The $47.00 passenger vehicle fee includes $12.00 for the regular renewal fee and $35.00 for the special plate. The plate's best feature is that a portion of the fee for each plate will be returned to the school for academic scholarships. Depending on the number sold, North Greenville Alumni Programs will receive up to $20.00 per plate for the scholarship program. The sale of just 10,000 license plates could generate up to $183,000 in scholarship funds. Stop by your local Department of Motor Vehicles office to pick up an application for the one-of-a-kind North Greenville University license plates. NGU has many great gift ideas for graduates and supporters of the University. You can order some of these items directly from North Greenville University, and others from our licensed vendor, Church Hill Classics. NGU Ties, Charms and Beaded Necklaces can be ordered directly from NGU on the Donations Page. Other items must be ordered directly from our licensed vendor. Available in both pre-tied and traditional styles. A casual woven fiber necklace embedded with red and black beads and the NGU emblem on a pendant. Two different styles to choose from. Silver charm, a great decoration for a necklace or bracelet. A stylish desk or bookshelf item, from our vendor Church Hill Classics. Polished Wooden Box with NGU Crest. A great desk item for keepsakes, writing tools, postage and more! From our vendor Church Hill Classics. No desk is complete without this traditional item. Natural stone paperweight with attractive NGU seal. A classic item for holding important papers, letters, or stationery material. A beautiful wooden frame with gold-leaf crest and text on the matting. A beautiful wooden frame with gold-leaf crest and text on the matting with dual-matted photograph of the main entrance to campus.